Context: Set in Latin America, in particular in a small town in Colombia, in the 1950s, The Chronicle of a Death Foretold is a surrealistic work that employs journalistic writing to examine a murder that makes a whole society complicit in the act. The newlywed sister of the Vicario twins is returned to her family by her husband because she is not a virgin. She reveals her violator to have been Santiago Nasar. The excerpt shows that the twins are now out to kill him and they are not hiding it. Marquez is delivering biting social commentary on the complacency of a community that sees impending violence but does nothing to prevent it from happening. There had never been a death more foretold. After their sister revealed the name to them, the Vicario twins went to the bin in the pigsty where they kept their sacrificial tools and picked out the two best knives: one for quartering, ten inches long by two and a half inches wide, and the other for trimming, seven inches long by one and a half inches wide. They wrapped them in a rag and went to sharpen them at the meat market, where only a few stalls had begun to open. There weren't very many customers that early, but twenty-two people declared they had heard everything said, and they all coincided in the impression that the only reason they had said it was for someone to hear them. Faustino Santos, a butcher friend, saw them come in at three-twenty, when he had just opened up his innards table, and he couldn't understand why they were coming on a Monday and so early, and still in their dark wedding suits. He was accustomed to seeing them come on Fridays, but a little later, and wearing the leather aprons they put on for slaughtering. "I thought they were so drunk," Faustino Santos told me, "that not only had they forgotten what time it was but what day it was too." He reminded them that it was Monday. "Everybody knows that, you dope," Pablo Vicario answered him good-naturedly. "We just came to sharpen our knives." They sharpened them on the grindstone, and the way they always did: Pedro holding the knives and turning them over on the stone, and Pablo working the crank. At the same time, they talked about the splendor of the wedding with the other butchers. Some of them complained about not having gotten their share of cake, in spite of their being working companions, and they promised them to have some sent over later. Finally, they made the knives sing on the stone, and Pablo laid his beside the lamp so that the steel sparkled. "We're going to kill Santiago Nasar," he said. Their reputation as good people was so well founded that no one paid any attention to them. "We thought it was drunkards' baloney," several butchers declared, the same as Victoria Guzmán and so many others who saw them later. I was to ask the butchers sometime later whether or not the trade of slaughterer didn't reveal a soul predisposed to killing a human being. They protested: "When you sacrifice a steer you don't dare look into its eyes." One of them told me that he couldn't eat the flesh of an animal he had butchered. Another told me that he wouldn't be capable of sacrificing a cow if he'd known it before, much less if he'd drunk its milk. I reminded them that the Vicario brothers sacrificed the same hogs they raised, and that they were so familiar to them that they called them by their names. "That's true," one of them replied, "but remember that they didn't give them people's names but the names of flowers." Faustino Santos was the only one who perceived a glimmer of truth in Pablo Vicario's threat, and he asked him jokingly why they had to kill Santiago Nasar since there were so many other rich people who deserved dying first. "Santiago Nasar knows why," Pedro Vicario answered him. Faustino Santos told me that he'd been doubtful still, and that he reported it to a policeman who came by a little later to buy a pound of liver for the mayor's breakfast. The policeman, according to the brief, was named Leandro Pornoy, and he died the following year, gored in the jugular vein by a bull during the national holidays. So I was never able to talk to him, but Clotilde Armenta confirmed for me that he was the first person in her store when the Vicario twins were already sitting and waiting. Clotilde Armenta had just replaced her husband behind the counter. It was their usual system. The shop sold milk at dawn and provisions during the day and became a bar after six o'clock in the evening. Clotilde Armenta would open at three-thirty in the morning. Her husband, the good Don Rogelio de la Flor, would take charge of the bar until closing time. But that night there had been so many stray customers from the wedding that he went to bed after three o'clock without closing, and Clotilde Armenta was already up earlier than usual because she wanted to finish before the bishop arrived. The Vicario brothers came in at four-ten. At that time only things to eat were sold, but Clotilde Armenta sold them a bottle of cane liquor, not only because of the high regard she had for them but also because she was very grateful for the piece of wedding cake they had sent her. They drank down the whole bottle in two long swigs, but they remained stolid. "They were stunned," Clotilde Armenta told me, "and they couldn't have got their blood pressure up even with lamp oil." Then they took off their cloth jackets, hung them carefully on the chair backs, and asked her for another bottle. Their shirts were dirty with dried sweat and a one-day beard gave them a backwoods look. They drank the second bottle more slowly, sitting down, looking insistently toward Plácida Linero's house on the sidewalk across the way, where the windows were dark. The largest one, on the balcony, belonged to Santiago Nasar's bedroom. Pedro Vicario asked Clotilde Armenta if she had seen any light in that window, and she answered him no, but it seemed like a strange interest. "Did something happen to him?" she asked. "No," Pedro Vicario replied. "Just that we're looking for him to kill him." It was such a spontaneous answer that she couldn't believe she'd heard right. But she noticed that the twins were carrying two butcher knives wrapped in kitchen rags. "And might a person know why you want to kill him so early in the morning?" she asked. "He knows why," Pedro Vicario answered. Clotilde Armenta examined them seriously: she knew them so well that she could tell them apart, especially ever since Pedro Vicario had come back from the army. "They looked like two children," she told me. And that thought frightened her, because she'd always felt that only children are capable of everything. 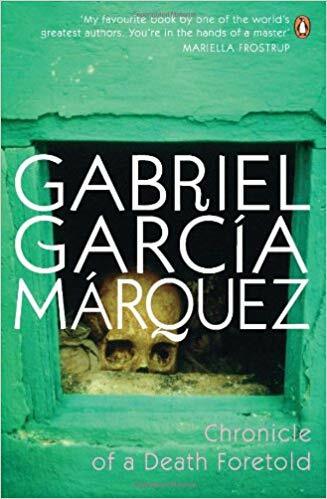 Chronicle of a Death Foretold is a novella by Gabriel García Márquez, published in 1981. It tells, in the form of a pseudo-journalistic reconstruction, the story of the murder of Santiago Nasar by the two Vicario brothers. The more that is learned about the murder, the less is understood, and as the story races to its inexplicable conclusion, an entire society, not just a pair of murderers, is put on trial.